The Riverside Premier Rehabilitation and Healing Center (formerly Kateri Center) is Manhattan’s foremost short term rehabilitation and long term nursing center. Overlooking the picturesque paths of Riverside Park along the Hudson River, The Riverside is an oasis of refined comfort and care in the heart of Manhattan’s Upper West Side. Renowned for our warm atmosphere and our exceptional standard of care, those we care for enjoy the finest amenities and a uniquely personal level of attention. With our Rehabilitation programs, we have elevated rehabilitation and healing to a fine art. Our program offers cutting edge techniques and individualized care, ensuring the highest level of recovery that will enable you to get back on your feet as quickly as possible. With a focus on our guests’ emotional, social and recreational needs, The Riverside hosts a rich calendar of events and programs to engage and entertain our guests. The Riverside has been undergoing a multi-million dollar renovation that will transform the community. 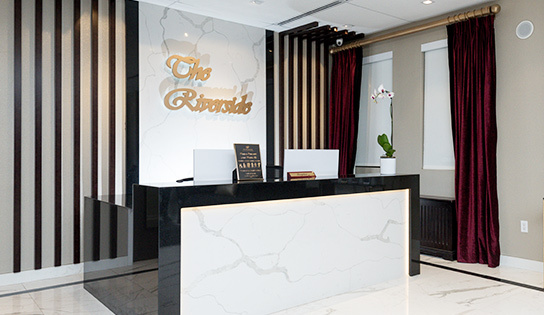 The Riverside is poised to be Manhattan’s most luxurious place to heal, relax, and recover.